While a month back, Iran unveiled a new home-made combat aircraft, which officials say can evade radar, Iran has now launched a homemade destroyer in the Caspian Sea, according to state TV. 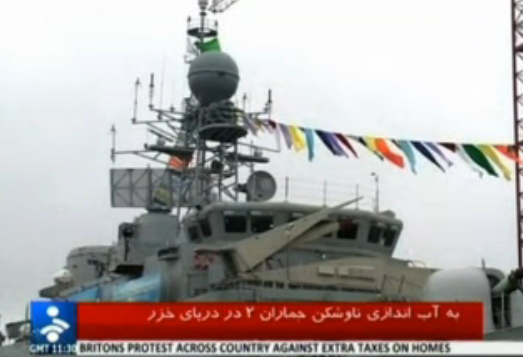 The event marked first time Iran has launched a major warship in the oil-rich region. The Jamaran-2 was inaugurated in the port city of Anzali on the Caspian Sea. The 1420-ton warship, which is longer than a football field and can sail at 30 knots with a 20,000-horsepower engine, was put in the water near the northern port city of Bandar Anzali, about 150 miles northwest of Tehran, the Iranian media said.